The European Commission called Catalonia's independence referendum illegal under Spanish law. MOSCOW (Sputnik) — On Monday, the European Commission confirmed that the Catalan independence referendum was “not legal” under Spanish law. Earlier, the Spanish authorities considered the vote to be illegal and took measures to foil the referendum, including closing polling stations and facilities used in the voting and during the results count. Moreover, European Commission spokesman Margaritis Schinas added that the Catalonia independence referendum, in which the vast majority voted to secede from Spain, is Spain’s internal affair and should be dealt with accordingly to the country's constitution. “This is an internal matter for Spain that has to be dealt with in line with the constitutional order of Spain,” a spokesperson said. On Sunday, a number of polling stations opened across Catalonia over the referendum on the independence from Spain.. 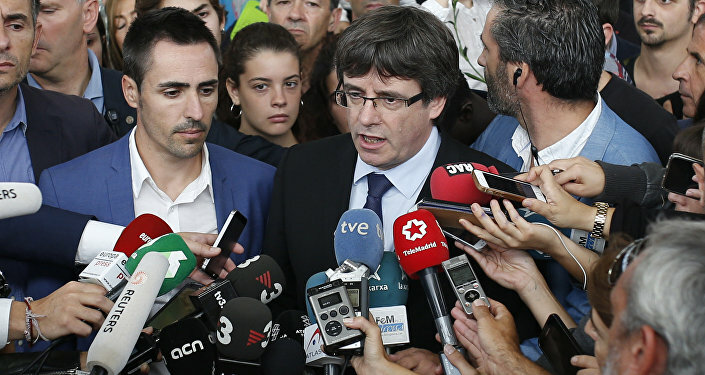 However, Catalan authorities said that 96 percent of polling stations were available for casting votes.